The most important benefit of using a pressure cooker is that it significantly reduce the cooking time. Cooking in pressure cooker is also the fastest method for cooking delicious and healthy meals. Today’s pressure cookers are extremely safe and very easy to use. By cooking food in a sealed environment, trapped steam generates internal pressures and also increase the temperature. The increased temperature and pressure significantly speed up the cooking process. Pressure-cooking can cook foods in about one third of the ordinary time on average and often over 10 times faster. Compared to a microwave, the food tastes considerably better. A pressure cooker can boil whole potatoes in 5 minutes, “roast” a whole chicken in 20 minutes. 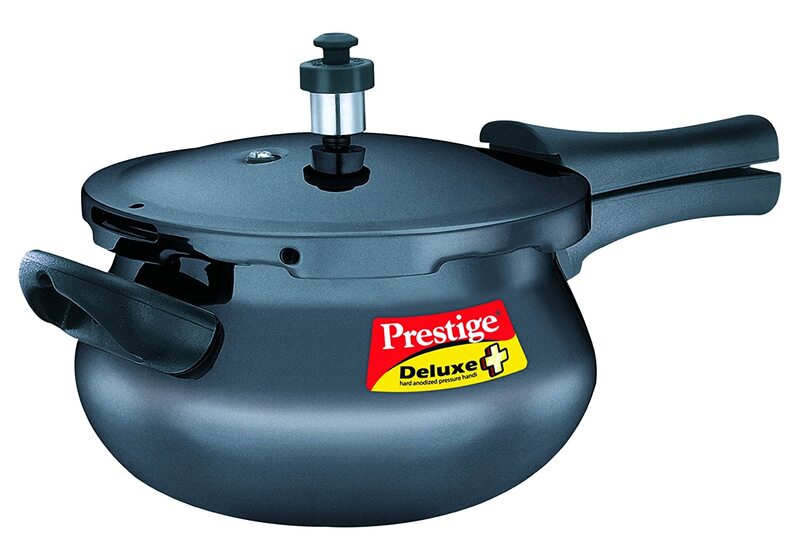 Pressure cooker in India is an exceptionally useful appliance. Save time and money: Pressure cooking saves considerable amount of time. You can prepare gourmet meals in just few minutes with the pressure cooker. A pressure cooker builds pressure from steam in the pot, thereby cooking food at above boiling temperature. This allows food to be cooked 70% faster than other methods of cooking, and consequently, less energy is used. Pressure cooking is healthy: When food is cooked in pressure cooker, it retains most of the vitamins and flavor. Vegetables are flash cooked preserving most of their nutrients. Bottom line: a pressure cooker is a great accompaniment to your healthy cooking efforts in the house. Tasty meals: Since the foods are prepared in the sealed environment, it prevents the loss of flavour and moisture in evaporation. So food retains its natural flavour, which is why a potato will keep its natural potato and earthy taste. Also, since moisture is maintained, foods don’t dry out and meats are cooked juicy and tender. Easy to saves space: The pressure cookers on the market these days have non-stick pots, making clean up a breeze. They are dishwasher safe, so cleaning up is just as easy as preparing your meal. They have stay cool handles. Some of the models will automatically switch to the warm setting when your meal is complete, so it will stay warm until you are ready to serve. There are also electric pressure cookers on the market today that have multi functions, like slow cooker or rice cooker. 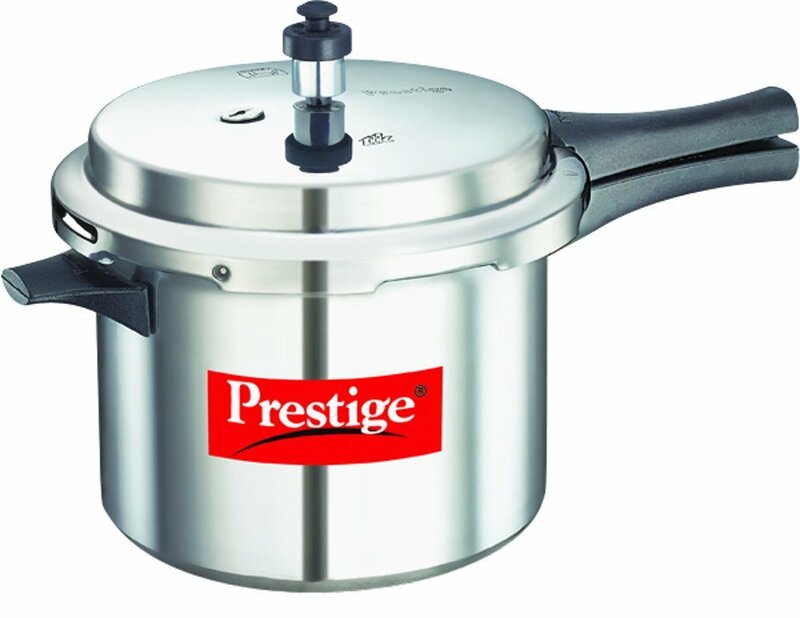 Pressure cookers are mainly made of two types of materials – Aluminium and Stainless Steel. While there are other materials available, these two are the most commonly found in consumer grade pressure cookers. Aluminum pressure cookers are less expensive, light in weight and provide even heating due to the excellent heat conduction of aluminum. With heavy use, however, aluminum cookware will stain and pit and, although this doesn’t affect how it cooks. 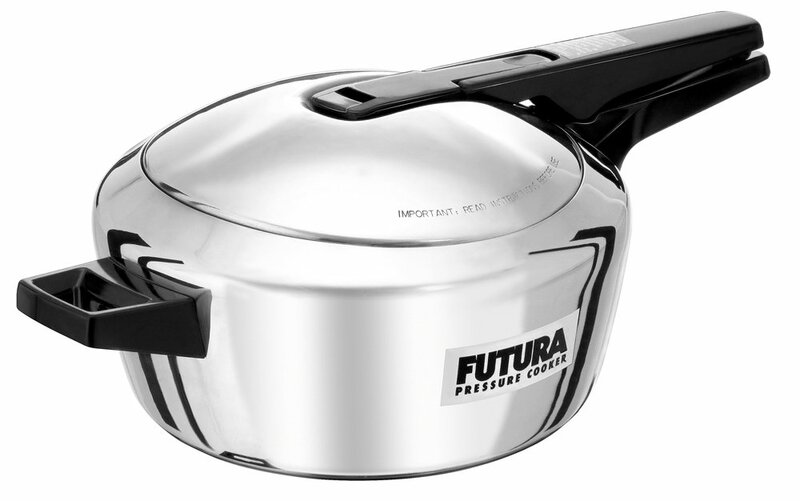 While aluminium pressure cookers are able to withstand high temperatures, it’s important to note that they cannot withstand extremely high pressure. If you’re going to be using consistently high pressure, then go for stainless steel pressure cooker. Pressure cooker made up of stainless steel are heavier and nonporous. They are also comparatively more expensive than aluminium pressure cookers. The extremely durable nature of stainless steel will provide years of use with a beautiful high luster finish. However, by itself, stainless steel is not a good conductor of heat, so it’s best to select a model with a layered base, usually a disc of aluminum bonded to the outside bottom of the pan. Pressure Regulator: Pressure cooker must have feature to control the pressure inside the cookware. There are three types of pressure regulators – weighted valve pressure regulator, modified weighted valve pressure regulator and spring valve pressure regulator. Regardless of which one you choose, always select a regulator with a maximum operating pressure of 15 psi. This is the standard pressure used in pressure cooking. Virtually all recipes are written for a pressure of 15 psi and if the operating pressure on your cooker is lower than 15 pounds, you will not realize the maximum time savings. The Handles: Most pressure cookers in India are equipped with dual plastic or plastic coated handles that will remain cool to the touch. The primary difference between designs is that some feature a long handle and are easy to carry with one hand. Others feature handles that fold away for easy storage. All function equally well. If you purchase a large pressure cooker, look for one with two side handles. The pots with food in them get heavy, so it’s easier to lift and handle a pressure cooker with two handles. If folding handles are available, you’ll require less storage space. Another important thing to consider is the availability of pressure cooker spare parts – you’ll want a pressure cooker that has ready access to spare parts. Cover Interlock: Its always better to purchase a pressure cooker that has cover locking system. This feature prevent pressure from building until the cover is properly locked and locks the cover until pressure is safely reduced. 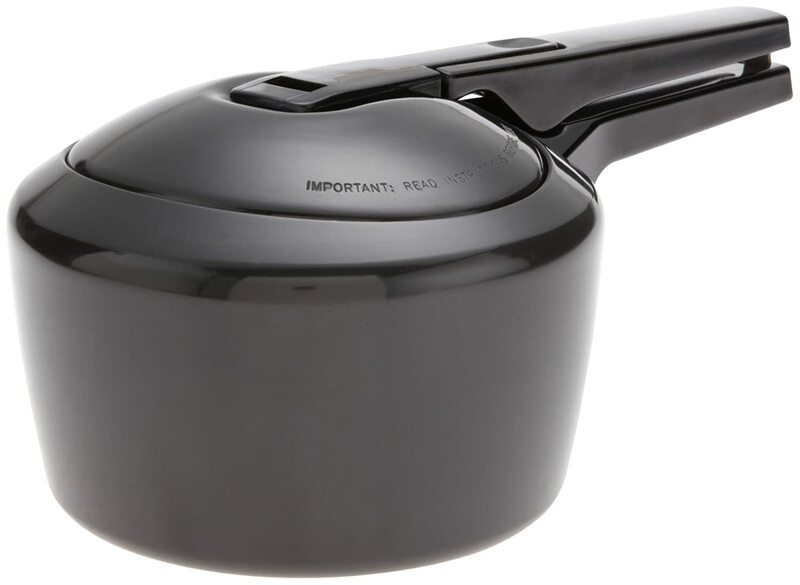 Most pressure cookers in India don’t offer a visual pressure indicator, but for those that do, it serves as an additional safety device. In addition to the aforementioned safety features, always look for secondary pressure relief mechanisms that are designed to release pressure in the unlikely event that the vent pipe should become blocked. Cooking Baskets and Racks: Choose a pressure cooker that comes with cooling racks. Racks and baskets allow you to separate different types of food within the pressure cooker. This will allow you to cook foods above the cooking liquid. 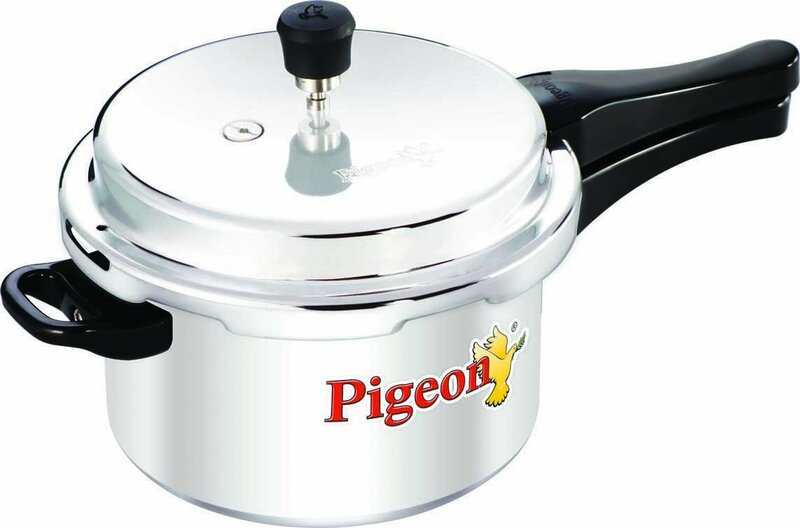 Base Material: If you are buying stainless steel pressure cooker, buy the one with either bi-metal or tri-metal base. They’re usually covered in aluminum to minimize scorching for easier cleaning. This also allows the heat to be evenly distributed throughout the pot, so that everything is cooked evenly. For stainless steel pressure cookers, the best quality ones are those marked “18/10 stainless steel”. This means the stainless steel is composed of 18% chromium and 10% nickel, which makes it more durable, resistant to stains, rust and corrosion, shinier and easier to clean. People always want to know which is the ‘BEST’ pressure cooker. There is no easy answer because this is largely a matter of personal preference based on your needs, and your budget. Keep in mind that whatever brand of pressure cooker you buy, it should be expected to give you a lifetime of service. Here’s some top pressure cookers in India. 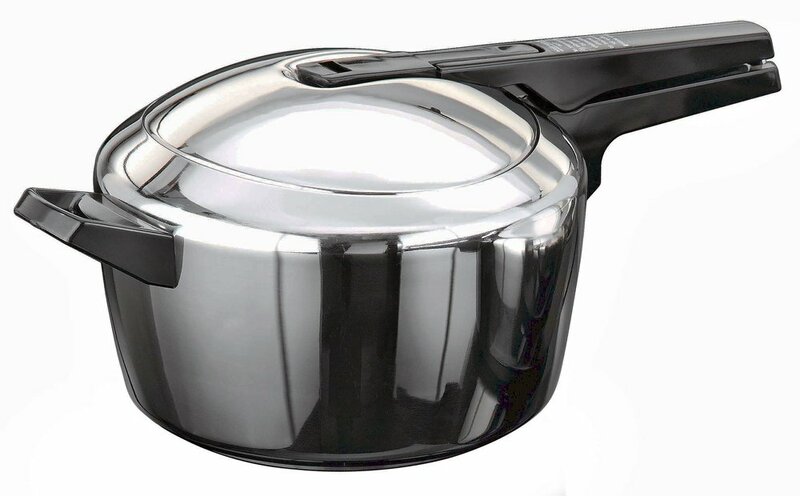 Presto’s 5.7 Litre stainless steel pressure cooker is a multi-purpose pot that can stand in as a conventional soup pot as well as perform the kitchen magic that pressure cookers are famous for. This professional-quality stainless steel pressure cooker is a handy addition to any well-rounded set of kitchen tools. With safety features that make your time in the kitchen a breeze, a beginner cook can create the most flavorful and healthy dishes with this Presto Stainless Steel model. This Presto 5.7 litre stainless steel pressure cooker eliminates issues that old models pressure cooker use to have – providing safety features that make cooking easy and safe. This pressure cooker comes with automatic release valve that keeps pressure at a safe level – there are no gauges or adjustable pressure gears – just constant and consistent pressure all throughout. It also has a cover lock indicator that tells you that pressure is still inside, preventing the lid from being opened and saving you from potential burns. In addition to a pop-up pressure indicator and a simple steam release mechanism, there is an over pressure plug that will let off steam if it builds up excessively. This pressure cooker is useful for weeknight dinners or for any meal that needs to come together quickly. 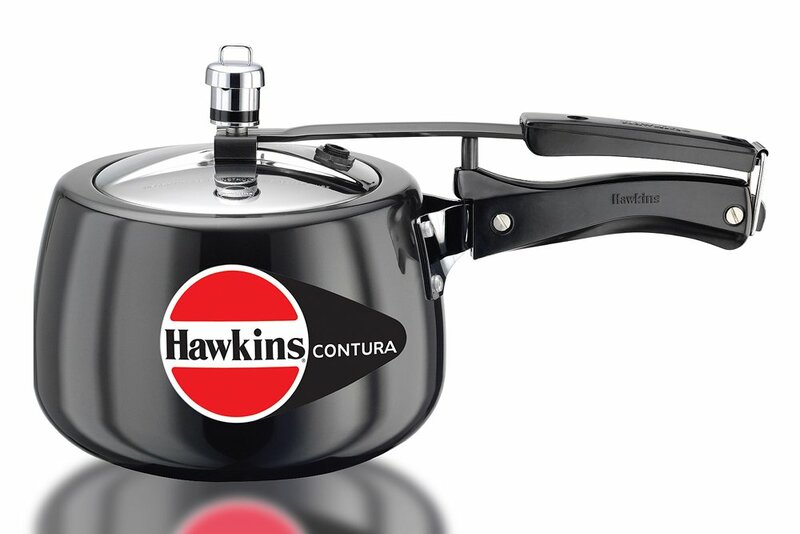 The Contura pressure cooker from Hawkins is designed to make your cooking experience quicker and more enjoyable. Its hard-anodized aluminium does not react with food, which means you will have safe and healthy food. With a well-built construction and aluminum body, you’ve got a sturdy pressure cooker that’s durable enough to last for years and years of cooking. The handle bars are also very durable as they are not attached to the handles but they’re actually a part of the metal handle itself. This ensures that these stay-cool handle bars are sturdy and lasts longer than regular pots. The 60-micron anodising enables the pressure cooker to absorb heat faster and save more energy. 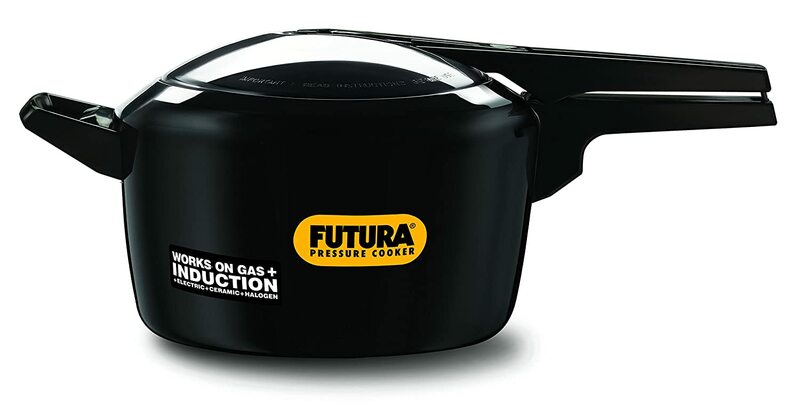 These pressure cookers can be used for cooking meals on gas stoves. The body of the cooker is curved which makes stirring much easier. 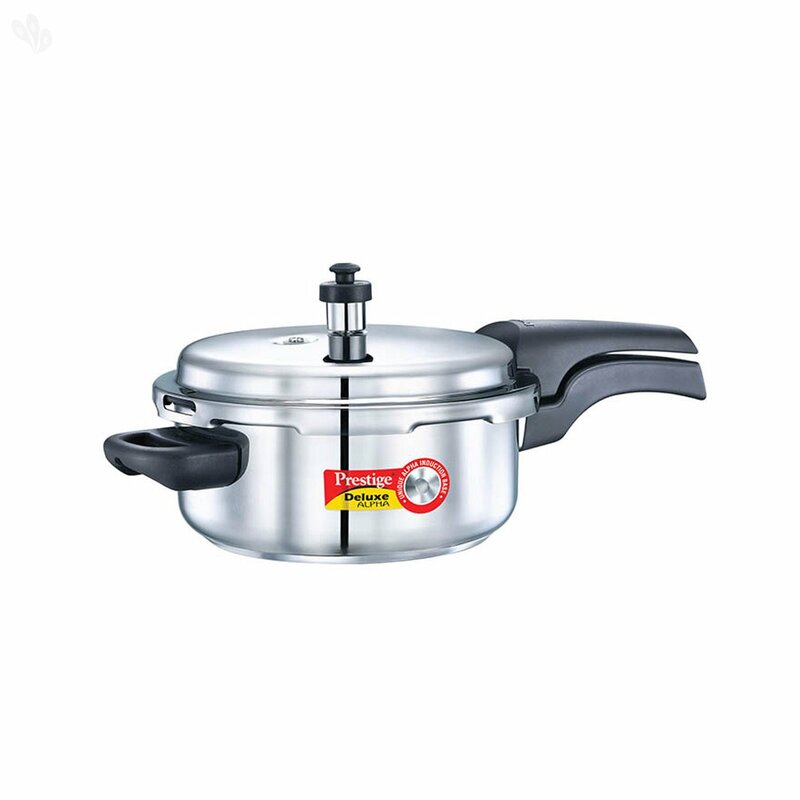 Designed with a broad opening, this aluminium pressure cooker provides you with a good view of its contents. Rice, vegetables and meats can now be quickly cooked in a short amount of time using this aluminium Contura pressure cooker. With a capacity of 3 litre, this pressure cooker lets you comfortably prepare a meal for three to four people. 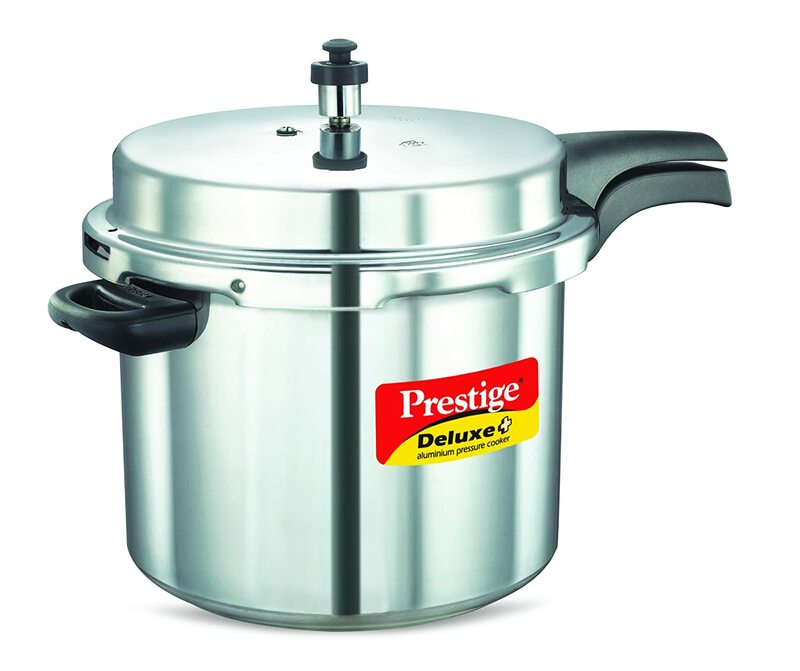 Deluxe Plus Hard Anodised Pressure Cooker gives you the convenience of aluminium cookers and the strength of anodisation, making it scratch resistant, stain resistant and stick resistant. 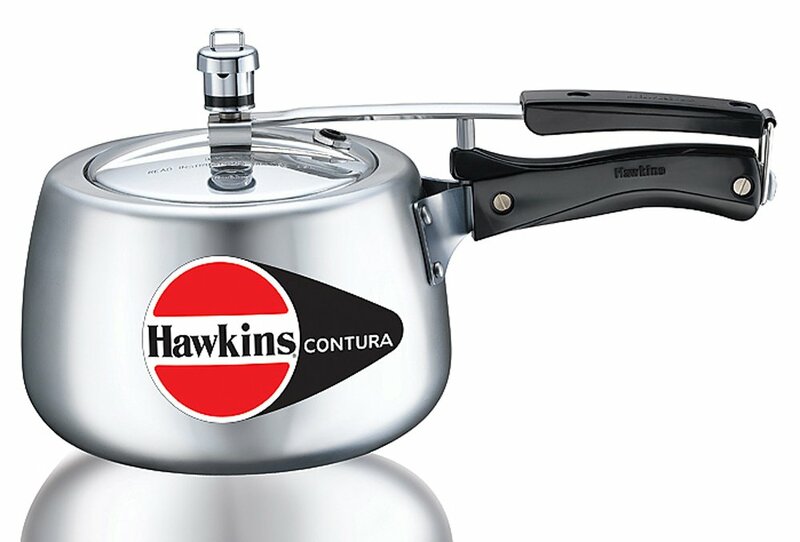 This Pressure Cooker comes with induction base which can work on any heat source and enables you to cook delicious dishes in a smart way at the highest level of safety through its Pressure Indicator which rises above the lid under pressure and drops when the pressure inside falls to zero, giving a visible indication to safely open the cooker. It is also aesthetically appealing to even serve at the table. For more popular pressure cookers in India, check below table.